I’ve covered some of the things that make me, well, ME in this blog, such as some personal experiences, my writing, my activism stuff. I’ve done this because I’m hoping to make posts a reader will find worth reading while also letting that reader get to know the person behind the virtual curtain. I was thinking today, “What else do I have to say?” Perhaps it doesn’t have to be some grandiose subject, though. It could just be something of ME. So what might be something people want to know? Well, when someone meets me in person, one of the things that they may find shocking is the amount of tattoo work I’ve had done. I got all of this ink knowing that judgement might be forthcoming, and there are times I’m anxious about meeting people because of it. Even in my writers’ groups, I was wary at first even though there was every bit of possibility that any of the writers might just view it as another art form rather than a stigma. Mind you, I don’t regret any of it. I look at it as getting to wear my favorite t-shirt every day. I’m sure I’m not the first person to use that analogy, but that makes it no less true a feeling. Now the question of why I did it. 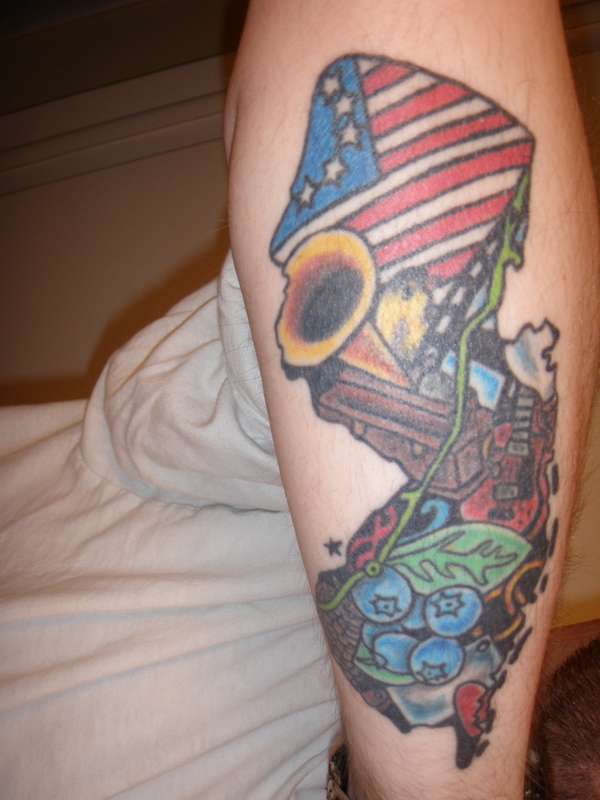 I’ve been a rock and roll/hard rock/heavy metal fan since I was 13, and tattoos are part of the culture. It was never a matter of not wanting them, especially from 15 on. It was a question of money and what to get. As I got older, I still didn’t have money or ideas. When I got married, it was to a rather conservative woman with a rather conservative family, so it didn’t seem like the best thing to do at the time. And, as mentioned earlier in my postings, I married into an instant family, and there was always something more important on which to spend money. I couldn’t justify the expense, and I still had no ideas. I didn’t want to get a skull with a snake crawling through its eye sockets and a fire blazing around it all like you see in tattoo shop windows. You know, the stuff everybody has (if they have them, that is). But then, at 36, I was separated, and of course having a hard time dealing with it all. I had many days with dark thoughts, and drank away a great many of those days. I did it for two months straight when my wife and stepson moved out and many stretches afterwards. To be frank, I think the drinking saved my life. A lot of memories from that time are naturally sketchy. As such, I don’t quite remember the order of events, whether the decision to get a tattoo came first, or the word I wanted to personify did. 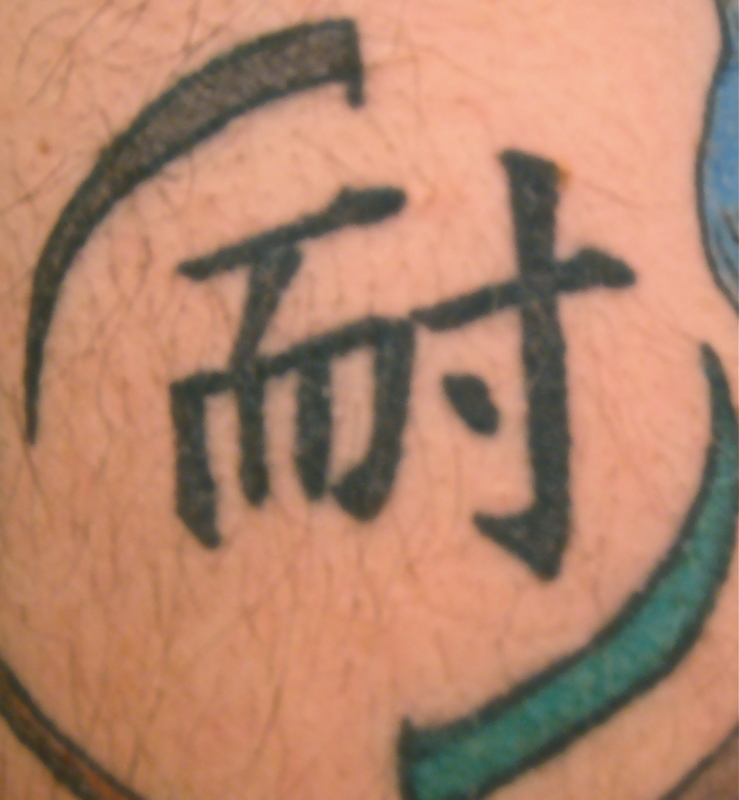 I think the word did, but either way, what I ended up with was the Kanji symbol for the word “endure” or “withstand”. I would start sinking, and I would tell myself, “Endure!” repeatedly until I got past it. I remember getting the divorce paperwork in the mail one day and huddling on my floor in response, speaking the word to myself to keep from the image in my head: assaulting my skull with a baseball bat. So I looked up the Kanji symbol online, turned to a co-worker of mine from China to verify it meant what I thought it meant, and set up the appointment. Now, the co-worker didn’t have the greatest skill with English, and may not have understood the words “endure” or “withstand”, but after considering the symbol I gave her, she thought about it and said, “Be strong”. Close enough. I still intended to have a relationship with my stepson, and his abusive father had a dragon tattoo on his right shoulder. I was worried that having this similarity to his biological father might freak him out, so I did a “twofer”. The symbol was to be put on the outside of my upper arm, and I would get my stepson’s initial on the inside of my arm for him as a way of alleviating any negative connotation. 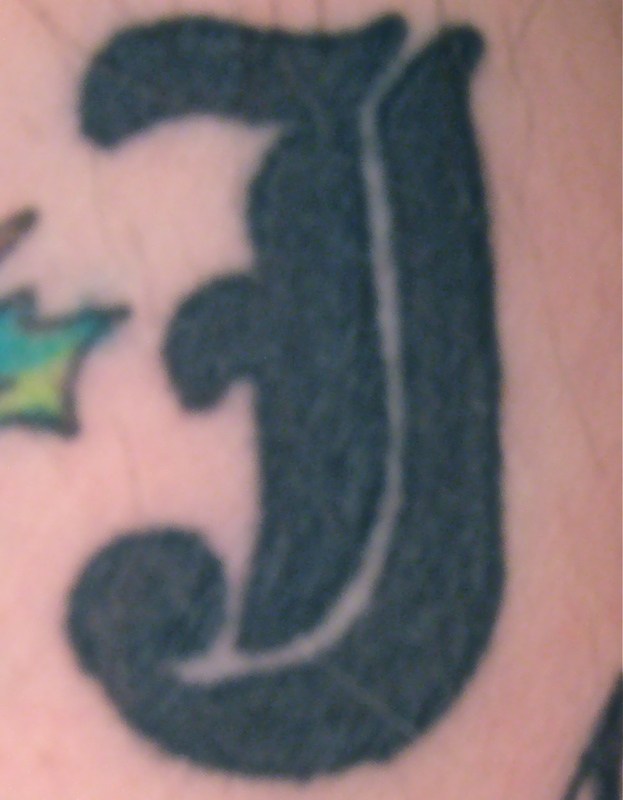 I also liked that his initial would be under my arm, because it would be a way to “keep him under my wing”. Now, I had these two tattoos on my right arm, and I’d get out of the shower, and see all of this negative space on my left arm. The incongruence bothered me. I played around until I figured out what to do on the outside of my left upper arm. 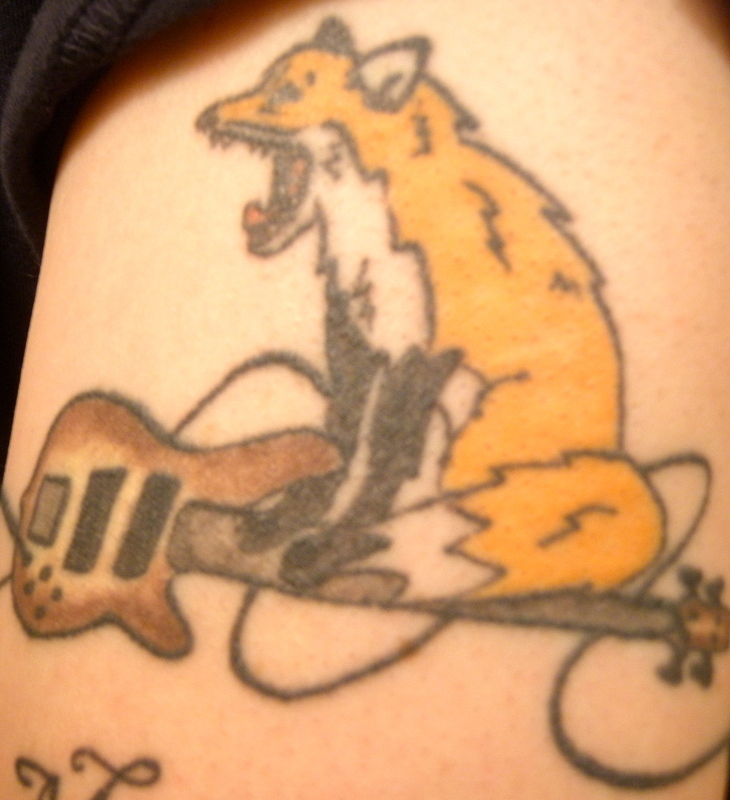 My last name is Fox, I love music, and my first instrument was the electric bass guitar. So I drew this up. The fox is supposed to be sort of surfing the bass, sort of guarding it, while screaming heavy metal style. The cord is coming out of the bass on the left and, instead of plugging into an amplifier, it plugs into the back of my arm on the right. The problem is, tattoos are addicting. You start thinking of all the things you can do, and all of the places you can do them. I came up with a family crest-type thing for my father when he got cancer (since in remission). I made an outline of New Jersey which has elements of NJ history and some of my own history in NJ included within the outline. 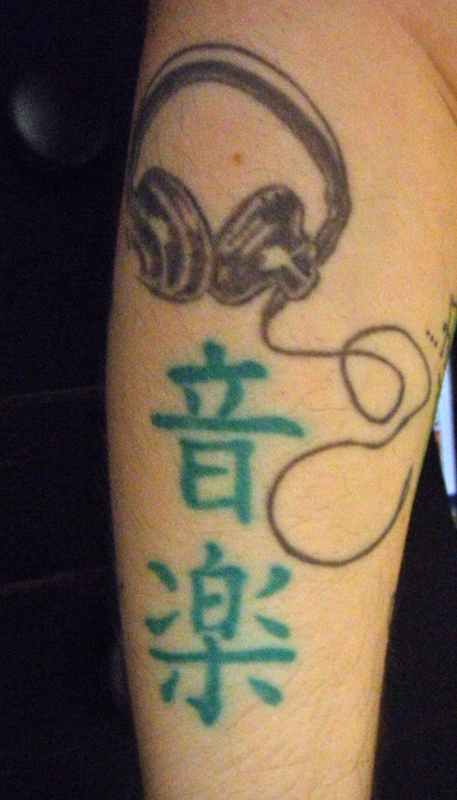 I have a pair of headphones with Kanji for “music”. 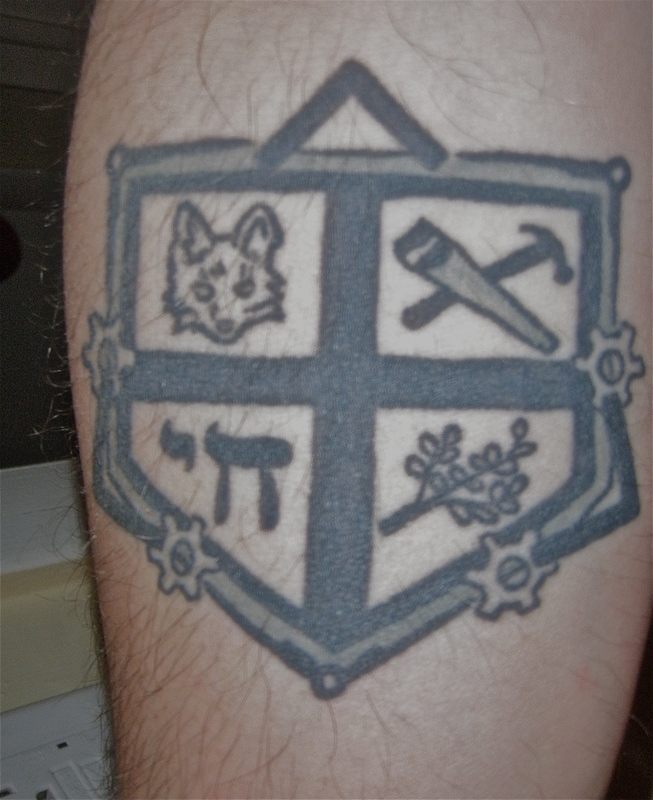 In the crest, I’ve got the family name (Fox, duh), my dad’s love of woodworking and being “the handyman”, his tradition, and the most important thing to him, family (represented by the branch). He was a mechanical engineer before retiring, so the border of the “shield” is made up of gears, drafting compasses (bottom and upper corners), and those “L” shaped rulers (at the top and at the lower corners). The Jersey one includes the phonograph, the movie, the lightbulb, and the solid body electric guitar, all invented here. It also has the state fruit (blueberries) and the state bird (American Goldfinch). It was one of the first 13 colonies (hence the older version of the flag), a pine cone (lower left–hard to see here) the outline of the NJ Turnpike, and a leaf symbolizing the Garden State. The other elements are more personal, such as falling in love with music here (hidden G and F Clefs), getting married here (the interlocked rings), and getting my heart broken here (I think you can figure that one out). The blue jay? I just love blue jays. You can see an “A” to the lower right of the jay. There it says “A & M” which are my niece and nephew’s initials. I’ve decided that I’m not going to have children after all that’s happened with my stepson, so those two are the future of the Fox family. To the left of the jay’s beak (above the “endure” symbol), I have the symbol for “Fox”. I also have other pieces, including depictions I’ve made from my own lyrics (not shown). 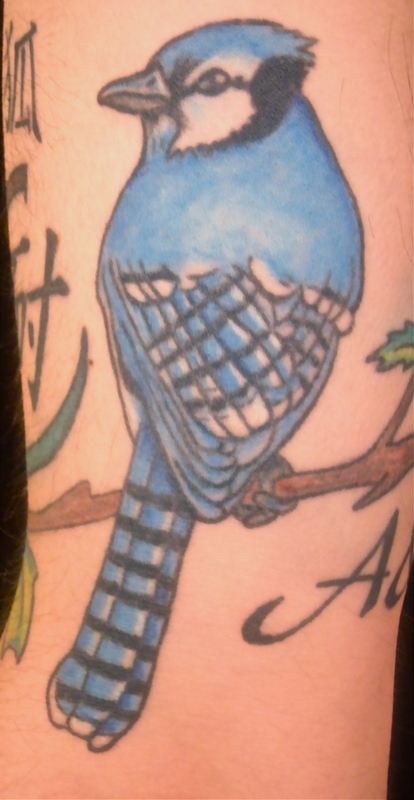 Other than the jay, my right arm is all family and “home” stuff, and the left arm is music stuff. I didn’t start getting work done until I was 36 (I’m now 40), but once I quit drinking so I could start to heal, entering this creative faze became the most fun I’d had in a long time, and it sustained me. It helped me to move on. My point in explaining all of this in detail? To hopefully get any readers out there to see tattoos in another light if they aren’t too keen on them. You see, they all have meaning to me, and every picture tells a story. This entry was posted in Uncategorized and tagged art, art therapy, every picture tells a story, expression, ink, inked, meaning, picture, story, tale, tales, tattoo, tattoos, therapy, why people get tattoos. Good post and it did help to explain why people get a tattoo. Several people in my family have tattoos, some for the wrong reason, for example, to glorify the criminal lifestyle, and others for meaningful reasons, such as serving in the military. My oldest granddaughter has one to signify her logo for her upcoming fashion designs, and as I said yesterday, I will get one, when I get my book published. I see them as landmarks. Mine tell where I’ve been, what I’ve been through, and who is important. I want to get one for my dog, Furgii, but the money hasn’t been there. Maybe with my tax return next year. One thing I forgot to mention is that the Jersey tattoo was originally going to be the NJ Turnpike logo. I wanted to get that because of when my stepson was in all those inpatient facilities (in Piscataway and thereabout) and my ex lost it and also went inpatient in Princeton. I worked in the morning, came home and showered, drove an hour to see one, then the other, came home and slept. Then I’d do it again. And when my ex was “on the outside”, we drove tons to see my stepson. We logged so many miles on the Turnpike that it was like a badge I’d earned, and I felt the need to symbolize that time. I decided I didn’t want people always asking me why I had the Turnpike logo on my arm, so I decided to have the outline of Jersey with the turnpike displayed within it. Then creativity took over and all of the details were added as I did some research about New Jersey history on newjersey.org. I like that your tattoos tell a story. There was an exhibit at the Seaport museum last year on tattoos. It covered the complete history, from ancient times to why Sailors and other military people were getting them, now. The interesting part was how each tattoo told a story about that person’s reason for getting a tattoo and what the tattoo meant to them. I think you would have enjoyed this exhibit. You’re right; I would have! If you ever hear of anything like that again, please let me know! Hey, Jordan, this was really fascinating. I have a fascination for tattoos, but don’t think i’d ever get one. I am however always interested in the meanings from which the come. It’s odd, I just got this post in my reader today and it’s 12/23. Don’t know why I didn’t get it sooner. Very enjoyable!